Dhoklas are great snacks and this is how I like my dhoklas. Give a try & see what I mean. For stuffing:(either stuffing should be dry not too soggy). 2 green chilli cut into thin strips(remove the seeds). Combine the soji, ajwain, and all the above stared ingredients. Mix to make a thick dhokla batter and rest for 10 min. 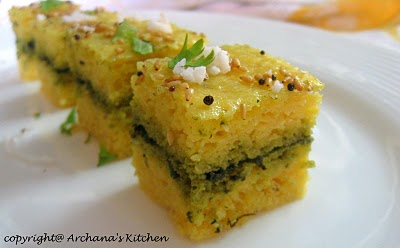 Brush your dhokla pans with a little oil and spread around 1/4 c or a little more of the batter over it. Put a layer of stuffing over the batter then a layer of mint chutney then spread another layer of dhokla mix over it again (make sure not to fill the pans more then 3/4 after stuffing). Put your dhokla pan in your dhokla pot & steam for 15-18 min. Put the coriander leves over the dhoklas, drizzle it with the seasoning and allow to cool for few min but do not cool it off completely. Apply some oil over your knife & cut the dhoklas into desired shapes & serve immediately with chutney & tea. A gud one . Will surely try it out . Thank U .